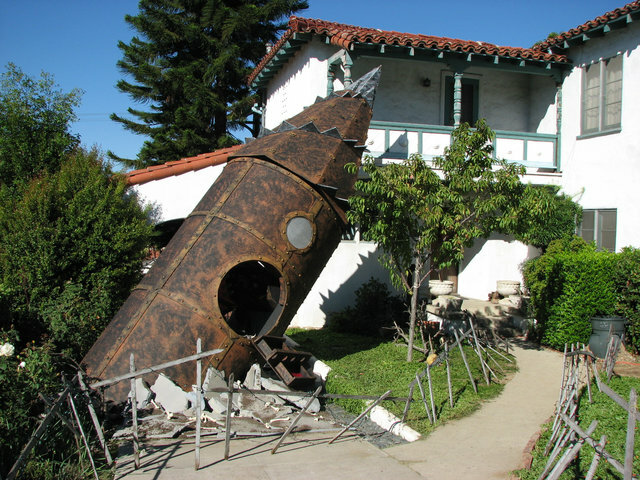 The giant steampunk drill was fired up last night...	! Amazingly, we built a bigger prop than the concept art showed. It's massive. The drillbit alone is 11 1/2 feet long. From the tip of the drill to the base of the cylinder is about 25 feet. The tip reached very near the top of my two story house. There will be more photos and video over the next few weeks, but I just wanted to put this up to let everyone know we got the project done. 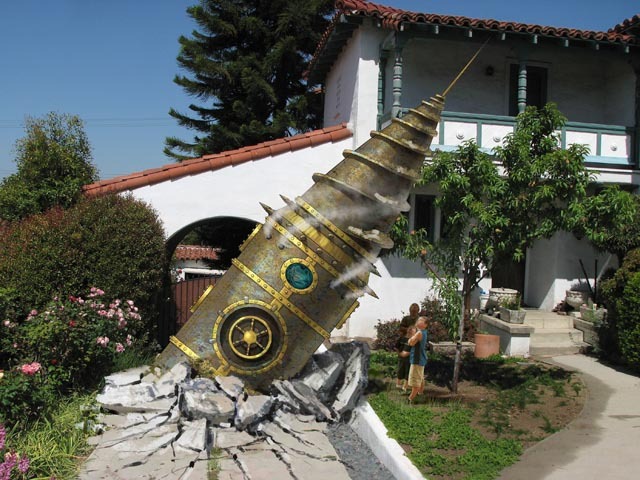 The giant steampunk drill is go! 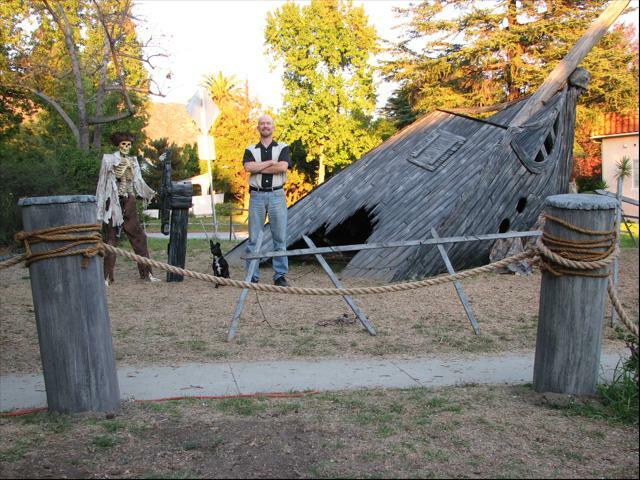 10/14/2010 - Thanks to the amazingly generous donations of 87 people, I hit and (exceeded by a bit) my fund raising goal to build the giant steampunk drilling machine for this year. For everyone who likes my display and has wished they could help... now is your chance! 9/22/2010 - The Halloween displays I put up each year are big, fun... and expensive. For my display this year I am planning on a very large and elaborate steampunk inspired drilling machine. However, I am looking to the community at large to help me pay for this using a website called "Kickstarter," which offers a simple way for you to donate via PayPal. The rules are simple. If I make my funding goal by the specified date, I get the money. If I don't make the goal, I get nothing. It's that simple. You can donate a little, or you can donate a lot. There are gifts provided at different donor levels to let you know how much your help means to me. Please watch the video below and then click on the Kickstarter link below to help me make an amazing Halloween display this year. Concept art for the drilling machine. The pirate ship from 2007 in the daytime. 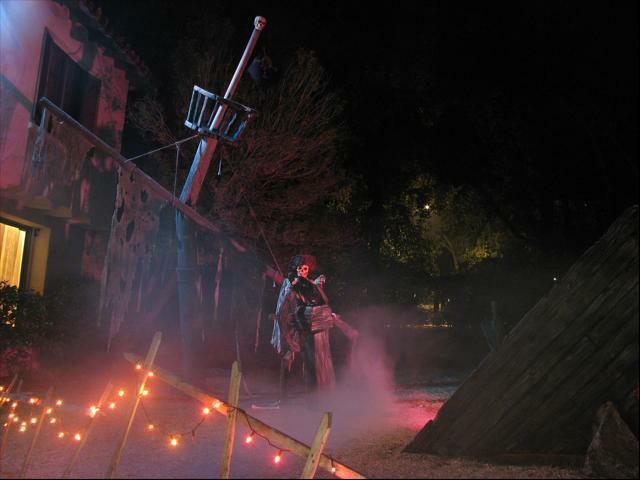 The pirate ship from 2007 fully lit at night. The steam train from 2008 in the daytime. The steam train from 2008 fully lit at night. 1/1/09- I added a new video that shows previsualization I did with my friend Glenn, as well as the finished display. 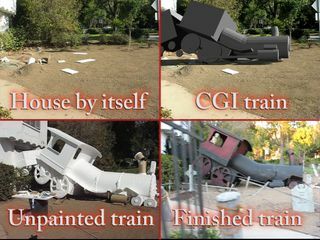 The pre-viz involved shooting footage of my house, tracking it with 3d tracking software, bulding a CGI model of the train, and then rendering and compositing it. The train model was deliberately simple, and was designed simply to show size and position. It was incredibly helpful in making the final decisions prior to construction. 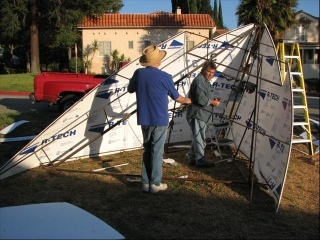 12/2/08 - The site has been updated with the addition of pictures and video from 2008. 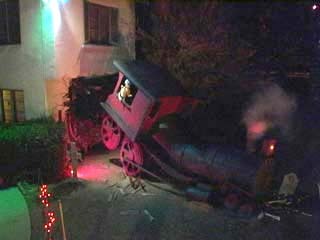 The theme this year was "Train Crash", and involved a nearly lifesize steam locomotive that appeared to crash through the front of my house. The pictures include both the construction and the finished display, and the videos this year have not only the shows, but also a timelapse featuring construction, Halloween night and demolition of the display. Second, all video on the site is now streaming. As long as you have the Flash Player, you can click on the videos and watch them. If you can see videos on YouTube, then you already have the Flash Player. 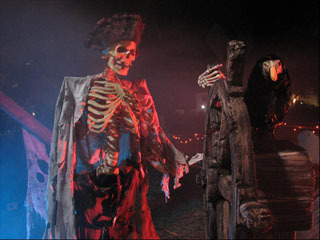 Third, I have finally added all new photos and videos from my 2007 haunt. Why did it take so long? See the first important piece of information above. This was by far my most ambitious show ever, and was only possible with the help of a lot of friends. Here's an image to show you what I'm talking about. Click on it to jump to the photo gallery, or use the "Pictures" menu on the left to get there. There are also extensive construction photos that can be seen.